I've seen a bike like this before of course. In Washington this past April. No, I doubt that anyone rode the bike here and docked it. BIXI supplies the DC Capital Bikeshare equipment and somehow one of those bikes slipped into the Montreal network. 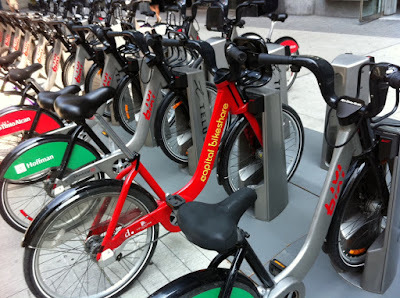 I wonder if there are Montreal branded BIXIs in DC or Toronto? Kind of like a public bike exchange program. On my way back to the office 20 minutes later, the DC bike was gone. If I didn't have the picture to prove to myself that my eyes didn't deceive me I might be thinking I had hallucinated the whole thing. Do you think the guy might be pedalling back to DC? He has quite a way to pedal!